The SDC North of England Region in partnership with Huddersfield University invite you to join this free half day event on Wednesday 27th March. The event will be chaired by Professor Parik Goswami who will introduce a number of guest speakers who are experts in the field of print. After the presentations a Q&A speaker session will offer delegates the opportunity to ask questions. Refreshments will be provided. The event is free to attend but booking is essential – please contact members@sdc.org.uk to reserve your place. Andrew Filarowski, Technical Director and Deputy Chief Executive at the SDC, completed his BSc (Hons) in Textile Chemistry at Leeds University, School of Textiles under the supervision of Dr Ian Holme. Committed to lifelong learning in the coloration sector he, together with the dedicated team at SDC, has devised the colour education pathway for both technical and design students. 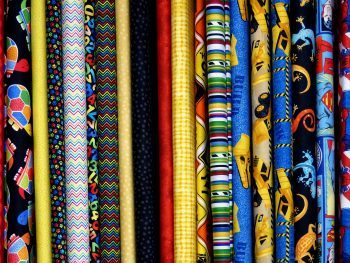 Gavin Thatcher has 30 years of experience in the textile industry gained in dry and wet processing, supplying decorated textiles into a wide range of market sectors. He is currently Managing Director Designate at Holmfirth Dyers, part of the Camira Group of companies. Gavin is particularly interested in the education of current and future employees in the textile industry and the promotion of textile manufacturing as a viable and relevant industry and career for young people. Dr Christine Holdstock, experienced Colour Science Consultant. Teacher of Colour Science at the University of Leeds for over 20 years, focusing on human colour vision, history of colorants and coloration, the origins of colour, methods of colour measurement and colour reproduction, and textile dyeing and processing. Duncan Ross is Commercial Director at AVA CAD CAM. After graduating from the Universities of Wolverhampton and the Fachhochschule Reutlingen in 1993, Duncan began his career in the “then” vibrant wallpaper and heat transfer industries. A four-year stint with the Borden Decorative Group provided experience of engraving, reproduction, wallpaper and transfer paper printing processes. A call for linguists from AVA CAD CAM in 1998, progressed his career in the textile and decoration industry and utilised his fluency in German. Linda Hodgson Design was set up in 2009 following a decade working for Skopos Design as a Senior Designer. Working as a Freelance Designer with a varied range of clients she designed and project managed a number of fabric collections for the contract furnishing sector. The role involves working direct with manufacturers sales, marketing and design. In 2014 Linda was approached by Sharps Fabric Printers to help set up the digital print facility as a Design Manager. Sharps Fabric Printers have been commission printing for over 100 years and have a strong presence in the furnishing sector. The introduction of digital print to the sublimation print facility has been fundamental to the growth of the company and Linda is very proud to be part of this progression. The role is very diverse and involves design, colour & print for some of the most prestigious furnishing companies worldwide. Linda has also worked in many Higher Education institutions as visiting lecturer, teaching printed textiles and use of colour and its application to textiles.